We often use the phrase "think outside the box" to encourage creativity in problem-solving. In my experience, many people incorrectly equate this phrase to mean doing something outlandish merely for the sake of being unique. The result of this kind of attitude can be an answer that is admittedly different, yet ultimately impractical. In a college marketing course, we once brought in an owner of a struggling Italian ice store. As a class, we assessed his business model and made suggestions for helping him attract new customers. When we finished, I felt that our brainstorming session was overall ineffective. The bulk of the suggestions were either over-simplistic and expensive, like "advertise more" or absurdly outside the box, like going door to door or using a network marketing model to sell ice cream. 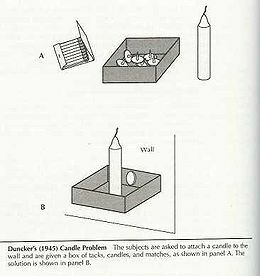 In 1945, psychologist Karl Duncker designed an experiment in which he challenged participants to fix a lighted candle on the wall in a such a way that the wax would not drip on the table below. To do so, he provided only a book of matches and a box of thumbtacks. Duncker found that many of the people attempting to solve his problem developed creative solutions, to no avail. For example, some tried to tack the candle directly to the wall. Others attempted to melt some of the candle’s wax and use it as an adhesive to stick the candle to the wall. In the end, the answer to the problem was simply to dump out the thumbtacks and use them to attach the empty box to the wall, which could then hold the candle. Duncker concluded that the reason why most participants did not find this easy fix was because they were experiencing functional fixedness, or a mental block against using an object in a new way that is required to solve a problem. In other words, everybody was so busy thinking outside the box that they forgot to think "the box". Coming back to the Italian ice case, I think that my class was so fixed on finding creative solutions that we missed the practical solution, which was to find a better location. His shop was located in Provo, Utah, the only college town in America where students don't drink alcohol. Emerging from this drinking dearth, the market forces forces that be have filled the void with the only thing that Mormons are allowed to get drunk on: ice cream. The last time I counted, there were over thirty ice cream, gelato, shake, and/or smoothie places in Provo. Most of them were situated very close to BYU campus. Our Italian ice friend, however, was located several miles away in place that rarely got foot traffic. In light of all this, my recommendation to him should have been either 1) move closer to the students in order to have a better shot duking it out with all of the other guys or 2) go to a city that was not so saturated with frozen saturated fat. In sum, there are many times when thinking outside the box is beneficial for solving problems. But don't forget to think about the box itself, too. Amazing example...funny thing is, I would have never thought of just thumb-tacking the box to the wall. I guess I prove the case in point! Amazing post by the way. Best one yet! Or change his business entirely to offer something more innovative and in-demand. I don't think there are any near-beer bars in Provo (or something equally Mormon-friendly that still captures the spirit of bars, i.e. a place to hang out and maybe meet new people). Something a little less seasonal too, no one wants ice cream in January.